Going to try something different: instead of dissolving everything in solution, I am only going to suspend it in Isopropanol. The stock solutions will be made in the same volumes (only with Isopropanol), but the reaction will not be run 5 times. Instead, the reactants will total approximately 10 mL and will be sonicated before the H2O2 will be added. For this reaction, 0.75 mL of the Mb/Citrate solution, 6.74 mL of OPD, and 2.51 mL of H2O2 will be reacted, for a total of 10 mL of liquid in the tube. Next week, the same procedure will be run with the rest of the buffers in Isopropanol, followed by Hexane, Acetonitrile, and possibly Toluene/Xylene (if we have any). DMSO will be run as well, but suspension procedure will not be required because everything should dissolve in DMSO, similar to MeOH. The reaction was started at 11:05. The first aliquot will be removed at 12:05 and a spectra will be taken. This will be done every hour. 12:05: The reaction is definitely proceeding forwards, but the tube must be shaken to prevent any reactants from falling out of solution. The solvent is definitely changing color, indicating the presence of the reaction. 1:05: The reaction was much darker than 1 hour ago, and the absorbances show that. Still needs to be shaken to keep everything suspended from falling out. Will update more when graphs are made. 2:05: The reaction did not proceed as much between 1-3 hours. 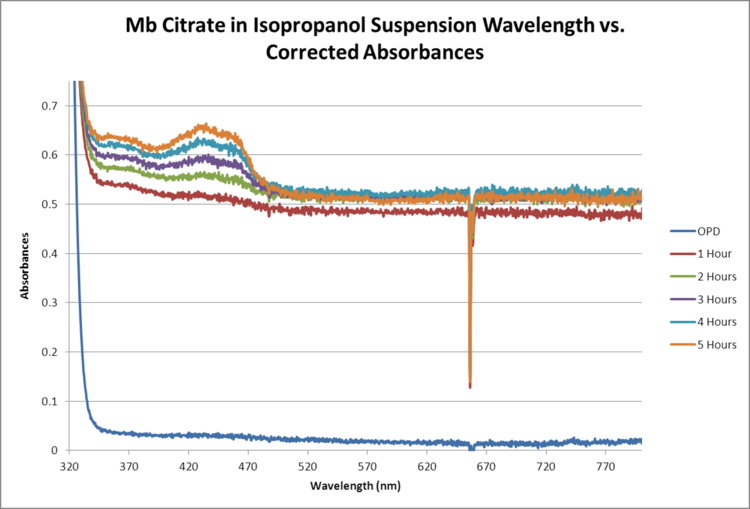 For the next time running this suspension reaction, use smaller time increments between taking spectra. 3:05: The reaction is still proceeding. The curve between 420-470 nm keeps growing, showing the reaction is still proceeding at this time. For the next time: Run the reaction for 50 minutes, then centrifuge for 10 for a total of 60 minutes, then take the spectra. Also, run a control of Mb and OPD with no Peroxide for a more accurate baseline. Also, run OPD and peroxide with no Mb to see if the reaction will proceed without the catalyst. The next reactions had smaller time intervals than this, because the gap between 0 and 1 hours was large. However, this data was consistently increasing, whereas the later data was not consistent. This page was last edited on 26 September 2017, at 22:43.